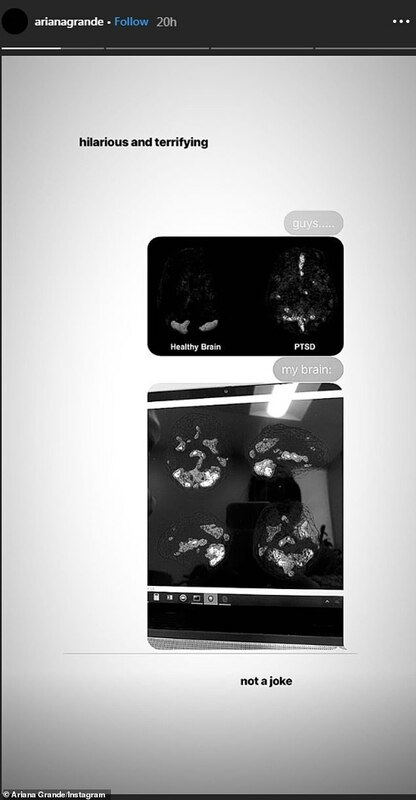 Ariana Grande has shared photos of her brain scans that appear to show signs of PTSD. For context, she also shared examples of a ‘healthy’ brain and brain ‘with PTSD’, both of which appeared far more mild than her own. Speaking to DailyMail.com, Dr Daniel Amen, a leading psychiatrist and brain scan specialist who pioneered the use of this technology for psychiatry, agreed that her brain has the hallmark ‘diamond’ shape of PTSD, and hailed Grande for destigmatizing mental illness. ‘Trauma can leave a lasting impact in your brain and we can see it with SPECT imaging. And you can treat it with medication or therapy! But without pictures, you’re throwing darts in the dark at people,’ Dr Amen said. ‘Most people are just diagnosed on symptoms, and you don’t know what’s really going on in their brain, which makes treatment difficult. Dr Amen broke new ground to show PTSD’s distinct hallmarks in 2015 by publishing a paper in the journal PLOS One. The study featured 20,000 people with either PTSD (post-traumatic stress disorder) or traumatic brain injury (TBI), which have similar symptoms but manifest very differently in the brain. Each participant was scanned with SPECT (single-photon emission computer tomography) imaging, which measures blood flow across the brain and in each brain region. 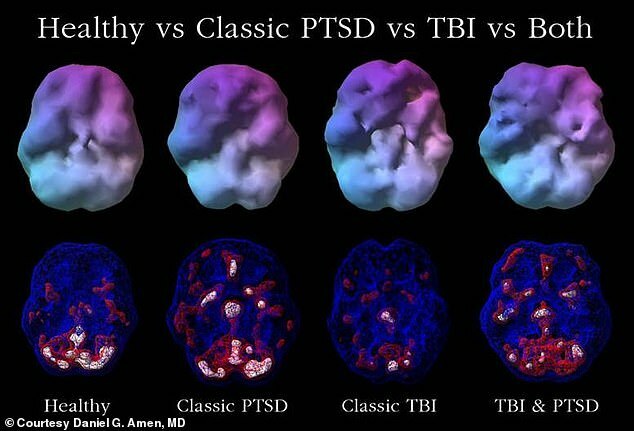 They managed to create a map of what PTSD looks like. At the top there is the anterior cingulate gyrus, which is the brain’s ‘gear shift’ for controlling emotional response. ‘When it’s overactive, people get stuck on negative thoughts, it’s like the trauma can loop,’ Dr Amen explains. 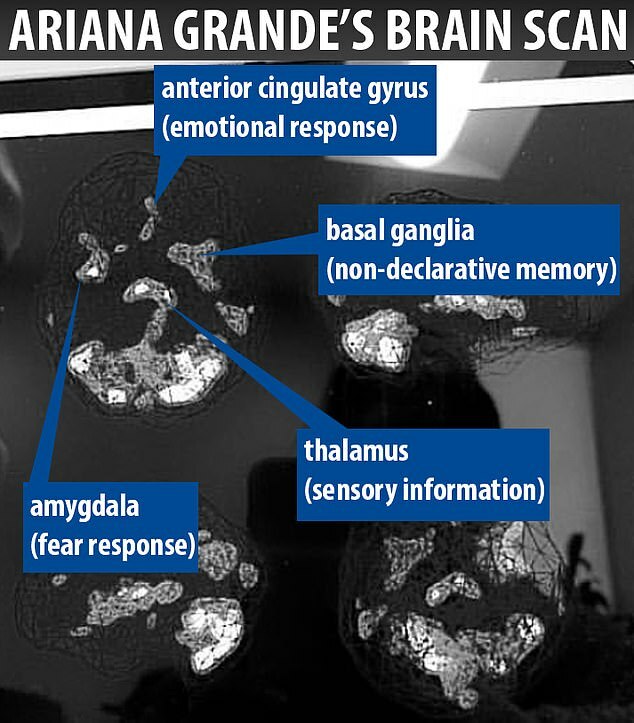 On the two sides there is the amygdala, which controls fear response, and the basal ganglia, which also affect emotion as well as background ‘non-declarative’ memories. The VA’s National Center for PTSD lays out four main ways a person may experience PTSD. Treatment for PTSD has developed dramatically in the last few decades. Thanks to NIH- and VA-funded studies on veterans from the Iraq and Afghanistan wars, PTSD research gaining momentum. Dr Amen said Grande adding her voice to this issue not only shines light on brain scan technologies available, but helps to destigmatize the symptoms many suffer after a traumatic event. ‘Most of mental illness is not mental, it’s brain. If we don’t understand that, people often don’t get the help they need and people end up getting shamed,’ Dr Amen said.